Inventory We are a resale marketplace, not a box office or venue. Ticket prices may exceed face value. This site is not owned by Arvest Theatre at The Midland . The Arvest Bank Theatre at the Midland, commonly referred to as the Midland Theatre, has been bringing entertainment to the Kansas City area since 1927. 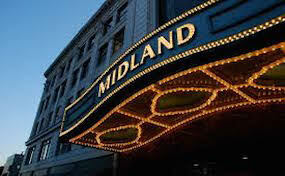 Known as the Loew's Midland Theatre for over 30 years the venue has had many names rotating around the Midland theme including: Midland Stadium, Midland 1-2-3 Theatre, and The Midland by AMC. The theater currently has a seating capacity of 3,573 and is owned and operated by AEG Live. The most recent major renovation was completed in 2008. The theater hosts artists all year round for intimate concert experiences in Kansas City. Midland.TheaterKansasCity.com is a privately owned and operated company that operates primarily in the online resale marketplace. We are not currently sponsored of affiliated with any official website, supplier, box office, and or venue. Ticket prices on our sites tend to be above face value but will change quickly with demand. To order tickets for any Arvest Bank Theatre at the Midland Kansas City events click through the steps online or at your earliest convenience give one of our friendly operators a call.